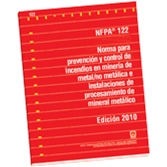 Apply the 2010 Spanish edition of NFPA 122 to reduce fatalities and property loss due to fire in underground metal and nonmetal mines and metal mineral processing facilities. Mining and mineral processing facilities represent significant fire and explosion exposures to both personnel and production equipment and buildings. This critical Standard addresses the protection of diesel-powered equipment and storage and handling of flammable and combustible liquids at these specialized sites. Revised requirements concerning portable fire extinguishers and fixed suppressions systems to improve operator safety and the reliability of the required suppression systems. Complete revision of the chapter on fire prevention and fire protection of surface mining equipment for consistency with fire protection industry practices and the updated provisions in the 2010 NFPA 120: Fire Prevention and Control in Coal Mines. New fire protection requirements for new and existing hydro-metallurgical solvent extractions (SX) plants, including a fire risk assessment of the facility and criteria for fixed fire suppressions systems. Related additional references and definitions were also added.